110.5. Imp-N-Cage: Somewhere in this hex of magma pools and basalt landforms, hanging from a chain beneath a natural land bridge that spans a flow of magma, there is an imp inside a cage constructed of logical fallacies. The cage is too convoluted for the imp, but perhaps a character with high intelligence could solve it. To simulate this, the Referee can prepare three riddles. If a player can answer all three of them, they succeed in freeing the imp, which will swear eternal loyalty (ha!) to its rescuer and even become their familiar if they are a magic-user. Each riddle that is answer incorrectly, however, costs the character one point of their intelligence score, permanently, as they find themselves trapped in logical fallacies. Of course, as difficult as answering the riddles is, the swarm of adamantine wasps that guards the bridge is even worse. ADAMANTINE WASP SWARM: HD 15 (76 hp); AC 0 ; Atk 1 sting (3d6+poison); Move 5 (F14); Save 4; CL/XP; 16/3200; Special: Poison (harden into ice, 1d6 damage per round, shatter when dead), magic resistance (12%). IMP: HD 2; AC 2 ; Atk 1 sting (1d4 + poison); Move 6 (F16); Save 16; CL/XP 6/400; Special: Poison tail, polymorph, regenerate, immune to fire. 110.29. Forlorn Golem: A stone golem sits on the banks of the Acheron, its feet in the black waters, chin on hands, elbows resting on knees. The golem was created by a mad wizard to besiege Hell, the wizard miscalculating the width and depth of the Acheron. Abandoning the concept, the wizard moved on and left his creation by the river to await new orders. He sits there to this day. STONE GOLEM: HD 15 (60hp); AC 5 ; Atk 1 fist (3d8); Move 6; Save 3; CL/XP 16/3200; Special: +1 or better magic weapon to hit, immune to most magic. 118.51. Natural Amphitheatre: There is a natural amphitheater located in this hex. The amphitheater has been accentuated with seating carved into the reddish-brown rock. 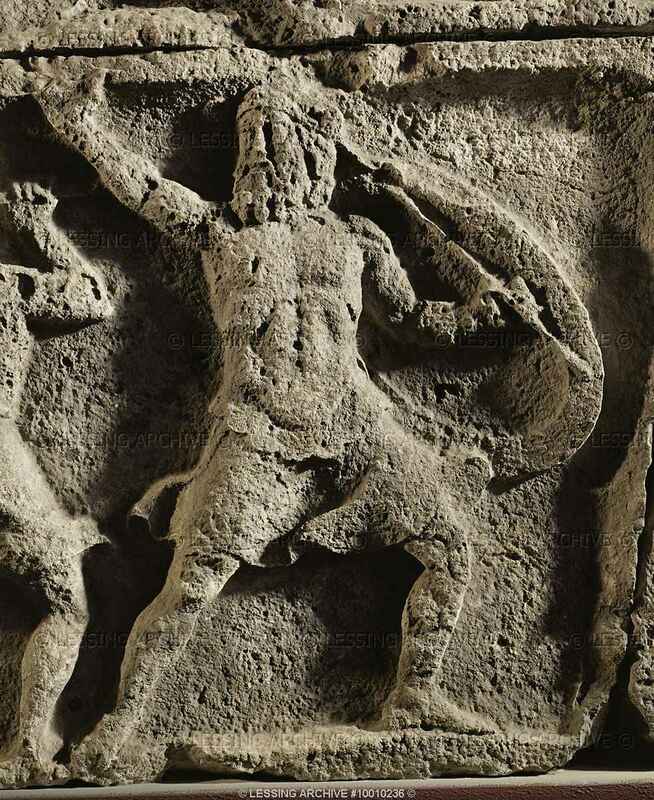 Against the back of the amphitheater there is what appears to be a bas-relief (deep relief) of a warrior in Greek armor, spear and shield in hand. He appears to be fighting, with his back against the wall. The statue is actually a warrior who was turned to stone while fighting the guardians of this shrine, for the amphitheater is a shrine dedicated to the Tenebrae, the daughters of Nyx and Eerebus. It is guarded by eight sisters, medusas with black-bronze skin and cool, green eyes. Each of these medusas, as a priestess of the Tenebrae, can cast three cleric spells, one of first, second and third level, each. The statue is still inhabited by the warrior’s spirit, now an ethereal shade. The shade appears when people walk on the “stage” and attempts to force a female adventurer touch his statue body. Doing this releases him from the curse, in which case the restored warrior can introduce himself as Damali, a crusader from ancient days. Damali is a 10th level paladin. ETHEREAL SHADE: HD 8; AC 1 ; Atk Icy touch (2d6) or special ability; Move 9; Save 8; CL/XP 10/1400; Special: Hard to see, immune to non-magic weapons, befuddlement.